With still a week or so to go on our Cats & Dogs: The Revenge of Kitty Galore competition, where you can win £20 worth of UK cinema vouchers, we thought we’d turn our attentions to the film itself. The first Cats and Dogs film, released in 2001, was a triumph for special effects in the way it merged live action with CGI. While the film may not have set cinema box-offices alight, it did prove to us something we’ve known for many years; cats are evil, dogs are the good guys. 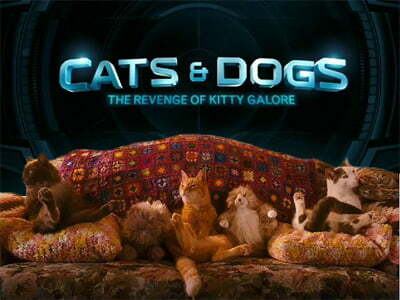 As the first film wasn’t a runaway success it is perhaps surprising that Warner Brothers decided to make a sequel, and even more surprising that they waited nine years for it when the only people who would have really enjoyed the original will now be more into The Expendables, than Cats & Dogs: The Revenge of Kitty Galore. But make a sequel they did, and reading some of the reviews online you’d think they’d made an abomination (as we’re led to believe has actually happened with Marmaduke). However. Cats and Dogs 2 (as we’re going to call it from now on to save space) isn’t a bad film at all. Yes, it’s for children, and only children will truly love it, but it’s also a relatively entertaining film with some funny moments and a few more than welcome nods to the genre. The opening sequence for example could have been lifted straight out of a James Bond movie – or, as we may never actually get another Bond movie, perhaps it has been taken from the seemingly doomed latest one. The spy genre, complete with gadgets, is well represented with this film – and it’s certainly more cohesive than the last children’s spy movie to get the 3D treatment, Spy Kids 3D (which incidentally, is getting another sequel too). The main theme of the film seems to be how cats and dogs can work together (and presumably live together, as owners of both would have us believe) by putting their mistrust and prejudice aside for the greater good. It’s a nice touch as the film teaches tolerance and understanding to children, while at the same time entertaining them with cats and dogs flying around on gadgets. One tip though, if you decide to watch the film – stay until the very end for the cute videos of the real stars of the show. Remember too to check out our Cats and Dogs 2 competition where you can win £20 worth of UK cinema vouchers. I was expecting at something better than the original from 2001, but no, i would have liked the movie only i were 12-13 years old.